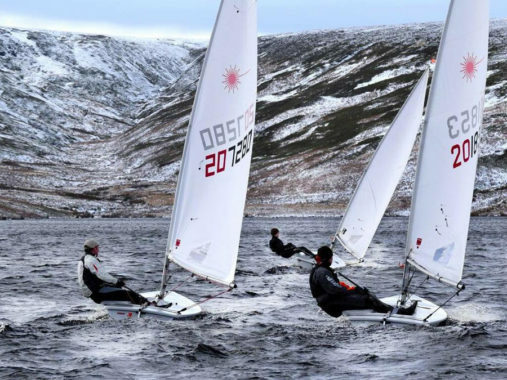 Over the weekend of 24th/25th February 2018 Beaver SC hosted the RYA Feva North/Midlands Zone Squad Training. There were six participating boats and crews. Thankfully again for a winter session the winds were moderate to light although on occasion a gust would send these plucky young sailors into the icy waters. Fortunately with modern gear (drysuits etc) they did not seem phased by their dips and nothing a hot drink back at the clubhouse couldn’t fix. Bright sunshine gave an illusion of warmth. As expected with squad training they were put through their paces with plenty of race starting practice and races around a windward leeward course. From the smiling faces seen all seemed to have enjoyed their experience. Beaver wishes these future prospects all the success they deserve in their sailing development. The International Topper Class Association (GBR) 4.2 Squad held a two day camp (non residential) and training session over the weekend of 17th/18th February 2018. Beaver welcomed these young sailors and wished them every enjoyment and success during the weekend. There were fourteen participating boats from as far afield as Poole and Paignton. The weather was not quite as chilly as has been seen recently but still a convincing nip first thing in the morning. 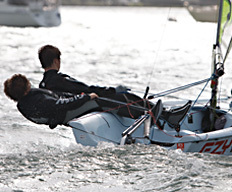 Winds for once for a young winter squad were kind and allowed decent control of boats. Trainers put the youngsters through their paces and by the end of the weekend race starts were much improved. Best wishes to all in their future sailing development. Despite the dropping temperatures and extremes of wind (from dead calm to boat-busting) 2017 Frostbite series has been a successful season. There are 44 names on the results sheet, albeit one or two are on for multiple boat classes sailed. Turnout on Sundays has regularly seen over 20 boats and all this at a time when sensible people are wrapping up and staying indoors. It seems that no end of cold-numbed fingers and toes, watering eyes and wind-chilled ears can offset the fun of a Sunday at the helm of a cherished boat. Sailors moan when they land ashore, walking uncomfortably in a cold-stiffened stoop but they still come back for more. After all this, it’s handicap so most have no hope of winning! After the 17th December Frostbite session it’s the Winter races that follow. Only for the real die-hards the next series begins on 7th January 2018. If any of the following words apply to you then maybe you’ll be up for it; gritty, gutsy, foolhardy, reckless, plucky, intrepid, stalwart, defiant or resolute. The RYA Windsurfing North/Midlands Zone Squad Training tookplace at Beaver SC on the weekend of 9th/10th December 2017. Due to the forecast snow on Sunday 10th the organisers decided to hold only the Saturday session. Despite the RYA’s preference that sessions be completed in all weather, the view this time was to ensure that no-one was put at risk when travelling. Conditions on Saturday were generally good with light to moderate winds but very low temperatures. Water temperature was undoubtedly icy and these brave young participants deserve all credit for taking part. Best wishes at your next meet. Welcome Commodore Tupper. Quentin is a long time member of Beaver Sailing Club having joined in 1996. He is married with four daughters and is a grandfather. 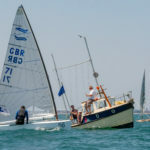 He has sailed a variety of boats including Enterprise, Mirror, Phantom and on to his current boat, a Streaker and has competed in these classes. 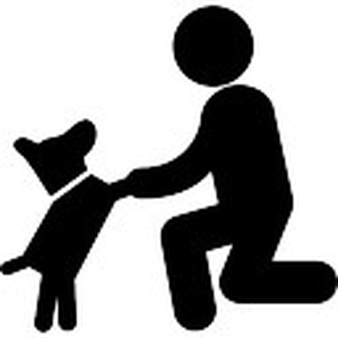 He has been a committee member since 2002, Membership Secretary since November 2009 and is a trustee of the Club. He was previously a member of Yorkshire Ouse Sailing Club and held position of Club Secretary there. 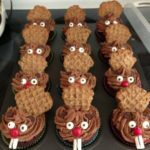 Beaver SC wishes Quentin every success in his new appointment and is certain that he’ll be given full support by members during the next three years of office. A big thank you to our retiring Commodore. The Club says a sad farewell to retiring Commodore Tony Wetherell. Not that Tony is going anywhere but he now stands down from his three year term of office. 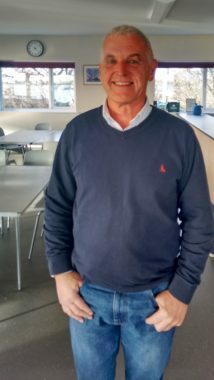 Tony has successfully managed some ongoing matters following the clubhouse rebuild four years ago and it is pleasing to say he is handing over to his successor with affairs in a healthy condition. 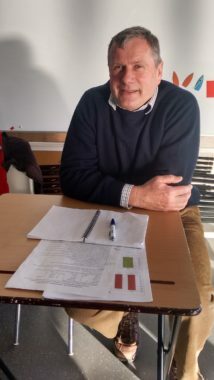 He has always made time for anything related to sailing and will gladly assist members with boating queries be it acting as deal broker, finding or selling a dinghy down to what knot to use to tie a control line. 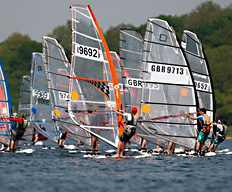 Fabulous to see him sailing his Laser at Beaver these days after near becoming a landlubber. 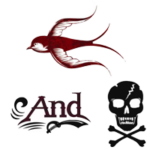 Long may you sail Tony. Thank you for doing a good job. You can now have your life back. Best wishes from your Club. 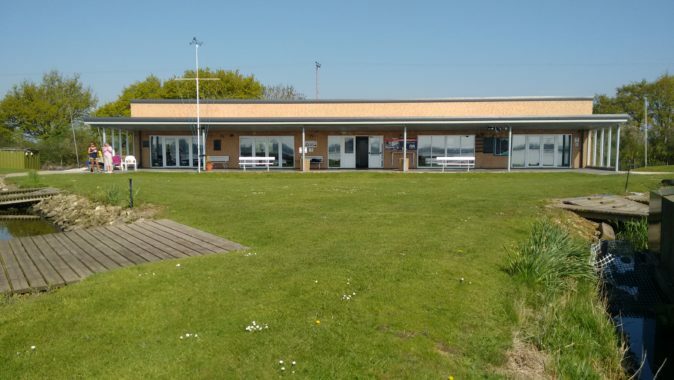 Beaver Sailing Club Annual General Meeting took place at the Club on Saturday 25th November at 11 am. The meeting covered election of officers, treasurer’s report, adoption of accounts and other business specified in the agenda. The meeting was well attended by members and after hearing the reports, new officers were elected by show of hands. A healthy post AGM Question Time was held and a number of matters were raised for discussion by the new Committee. Minutes will be posted on the Club notice board in due course. For information, a copy of the Club’s constitution can be read here. 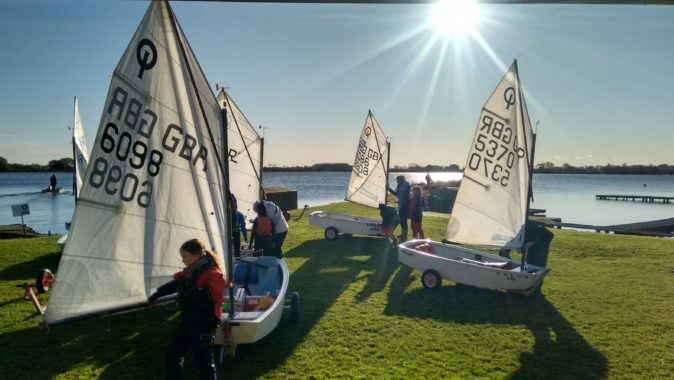 Beaver SC hosted the RYA Optimist North Zone Squad training over the weekend of 11th/12th November. There were thirteen boats taking part and there was much enthusiasm from the young sailors (and their supporting friends and family). Winds on the first day were gentle with the odd gusty patch but otherwise they all settled in quickly to their training. In the afternoon one or two began to feel tired from too much concentration. On the second day there were a more challenging set of conditions. Although sunny and bright with a more or less cloudless sky winds were strong with gusts around 30mph. Needless to say there was the odd capsize and those concerned quickly realised how cold Beaver waters are in November. These young sailors acquitted themselves well and responded positively to their trainers. Beaver Sailing Club is delighted to have been host to this event. 29th October saw the start of the Frostbite series. With the current balmy conditions it doesn’t seem right to mention the ‘frost’ word. Once you start having to scrape your windscreen you’ll believe it! The number of races is down to two the first one pushing off at 12 p.m. and second at 2 p.m. Both handicap. As usual for any results to count in the final reckoning you must have completed half the series races plus one. Remember to wear appropriate cold weather clothing e.g. wet/dry suit, gloves, hat, boot liners, spray top. Several layers are better. Time to end the sandwiches and savour some hot grub between races!